Pass this model motion in your Student Union! 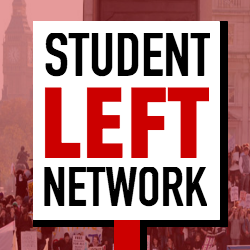 Get in touch at studentleftnetwork@gmail.com if you would like advice on how to submit a motion. Support a ‘Yes’ Vote in the UCU reballot for strike action! UCU announced on 26 November 2019 that members in colleges and universities will be re-balloted for strike action. The ballot will open on Monday 14th January 2019 and will close on Friday 22 February 2019. Any strike action that takes place will have an effect on teaching, marking, and other student services. The dispute is over a real terms decrease in pay of 21% since 2009 in higher education and a decline of 25% over the last decade for college staff. During this period there has also been a rise in precarious contracts, increased workload and the gender pay gap has gone unaddressed. On average, universities use hourly-paid staff for 27% of their teaching, academic staff work an average of 50.9 hours FTE per week and for academic staff, men on average earn 12% more than women. The Universities and Colleges’ Employers Association (UCEA) made a final offer of 2% at the final pay talks in May 2018. In order to catch up and keep up with the value of pay since 2009, 7.5% is needed. Any strike action would be taken as a last resort due to the UCEA’s unacceptable final offer during pay talks. There is an open letter signed by hundreds of students, alumni and workers in support of a ‘yes’ vote. Polling during the UCU strike over the pension dispute in 2018 showed a majority of students supported the strike. Staff in our universities and colleges should be properly supported, since they are the backbone of our educational system. Students will benefit from the pay dispute being resolved, since it will help continue to attract high-profile staff to our university and other UK universities, as well as making sure that they are motivated and happy – which will have a positive impact on their teaching. Staff have the right to challenge unfair practices, including the right to industrial action – which is a legitimate means of raising concerns about the enormous effect that the pay dispute will have in the financial futures of education professionals. UCEA have proven to be unreasonable throughout pay talks and industrial action is now required for this dispute to be resolved and for staff’s concerns to be addressed. [University] SU have an important role in helping students understand why this ballot is happening. By supporting industrial action amongst staff, [University] SU would pledge its support to its Postgraduate Research Students (PGRs), some of which are already teaching and may go on strike or may be affected by the changes in the future. To write a letter to the Vice-Chancellor, demanding an improved pay offer of 7.5% to be made by UCEA and for a framework for action to close the gender pay gap and reduce precarious contracts to be produced. To publicly support a ‘yes’ vote on this ballot and support and publicise any upcoming strikes, and all future strikes for the next three years irrespective of duration and not limited to pay. To speak out on behalf of Postgraduate Research Students (PGRs), in order to defend their interests. To run a campaign working with materials provided by UCU, both physically and digitally about a ‘yes’ vote, educating students and encouraging them to get involved. To assign funds for student led initiatives in support of a ‘yes’ vote of up to £350 per initiative e.g. for leaflets.